Revealing mistake: When Tom Cruise and his girlfriend are visiting his former arch rival and now good friend, his wife calls Tom "Tom", not by his character's name. Factual error: One of the first races that Cole runs is Phoenix. Phoenix International Raceway is a very flat track. There are several shots in that segment showing a high-banked oval. 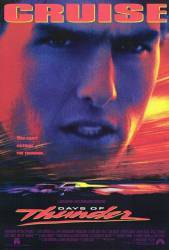 Trivia: The scene where Tim approaches Harry at a tractor was filmed at the farm of NASCAR legend Junior Johnson. Harry Hogge: Drivers can't stand to be reminded of what can happen to 'em in a racecar. They, they don't go to hospitals, they don't go to funerals. You get a driver to a funeral before he's actually dead, you've made history, darlin'. Dr. Claire Lewicki: Control is an illusion, you infantile egomaniac. Nobody knows what's gonna happen next: not on a freeway, not in an airplane, not inside our own bodies and certainly not on a racetrack with 40 other infantile egomaniacs.